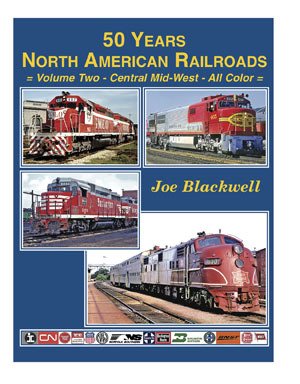 This all color title features the many railroads fanning out from Chicago to Kansas City and the Mid-West. Not only are the major roads featured, such as CB&Q, GM&O, Santa Fe, IC, ICG, Rock Island, MP, NS, UP, Wabash, N&W, C&EI, CN and KCS, but there are many area short lines included. Don't miss this fantastic book which includes photos by many famous photographers.